One fact that would surprise many Franco fans is that many of his songs were actually paid infomercials. One of the most famous of his infomercials was the song AZDA released in 1973. 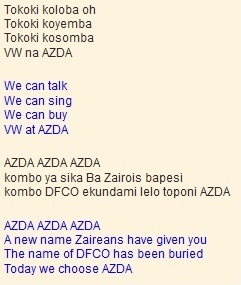 It was a song about a Volkswagen dealership known as Association Zairoise d’Automobiles or AZDA for short. This entry was posted in Franco & TPOK Jazz songs, Songs and tagged AZDA, Franco Luambo. Bookmark the permalink. i like luambo muzik very much. Good work people, so nice to understand what we like listening to. Keep it up. Do you have lyrics and translations of Ndona by franco? Excellent translation for AZDA,that song was my favourite as a high school student in the mid seventies. Could you possibly translate the lyrics for LUKANI by Orchestra Veve (or was it Orch Kiam?) and also AYI DJO by Les Kamale.